Gala Casino - play classic fruit machines and get £400 free! Gala Casino is a UK based online casino with a wide variety of games and lots of Playtech slots and fruit machines. Many players are likely to know their other brand: Gala Bingo. 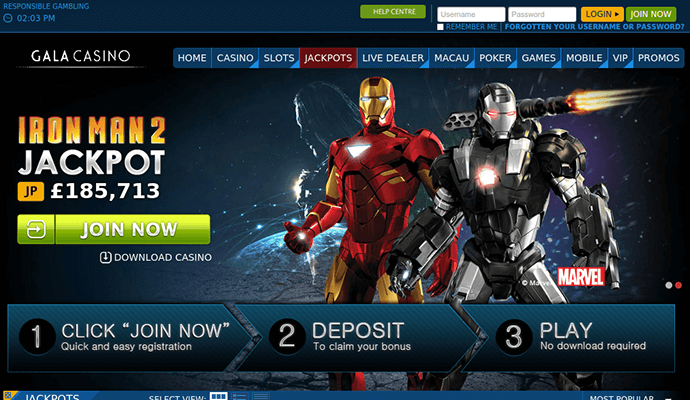 It’s one of the few casino’s that offers a lot of Marvel games, such as the Avengers slot and the Incredible Hulk fruit machine. A very big plus in our opinion. Most of the games Gala Casino offers can be play in Instant-Play mode (without downloading them) or if you prefer by downloading them first. Mobile playing is available as well: most of the fruit machine games are playable in a specific touch version on the mobile websites. You can access the site by clicking one of the buttons above and it will automatically open in your browser when the official app isn’t downloadable in your countries Google Play of Apple store. Unlike a lot of other online casino’s Gala offers their new players a choice in what welcome bonus they would like to receive. For example, if you are more of a Roulette player, you can opt for the special Roulette bonus worth €200. If you’re more of a fruit machines person, you’re likely to choose the slots bonus of €400. Each bonus is especially meant to wager at the specific casino game of your choice. Support is 24/7 available. You can reach Gala Casino by phone, e-mail, Live Chat or Skype if you prefer.